A newspaper article published by The Central Florida Press on June 20, 1930. 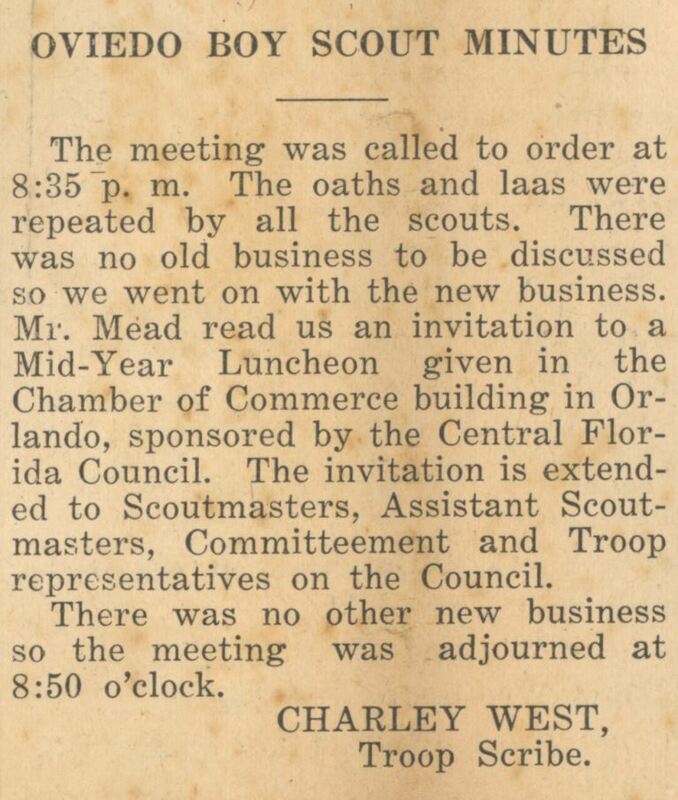 Written by troupe scribe Charley West, the article summarizes the meeting minutes for the Oviedo Boy Scouts. The meeting included a discussion of an invitation to the Orlando Chamber of Commerce's Mid-Year Luncheon. Original newspaper article: "Oviedo Boy Scout Minutes." The Central Florida Press, Vol. 1, No. 9, June 20, 1930, page 2: Oviedo Historical Society, Oviedo, Florida. 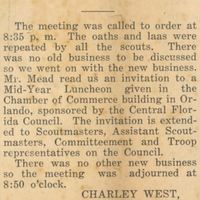 Digital reproduction of original newspaper article: "Oviedo Boy Scout Minutes." The Central Florida Press, Vol. 1, No. 9, June 20, 1930, page 2. “Oviedo Boy Scout Minutes.” RICHES of Central Florida accessed April 24, 2019, https://richesmi.cah.ucf.edu/omeka/items/show/5708.